The Marquis Family established our Registered Black Angus herd with one simple goal in mind,"To produce the Best Quality genetics possible for the Commercial Cattlemen". We start with some of the finest genetics available today. We use AI Sires with mostly Western influence. 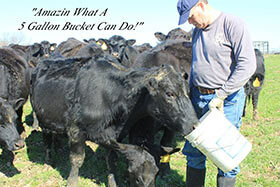 Cattle that are accustomed to hard winters,hot summers and drought conditions. All of our breeding stock have "Stacked" pedigrees with generations of well known sires and Dams. All stock are put through a rigorous health program and are innoculated for prevention of Clostridium Chauvoei,Septicum,Novyi,Perfringens types C&D, Haemolyticum, ( 7 Way Black Leg),Tetanus,IBR,BVD types I and II, P13,BRSV, Mannheima Haemolytica and Pasteurella Multocida,Vibrio,Lepto plus Hardjo-Bovis. Various wormers are rotated for maximum effect. 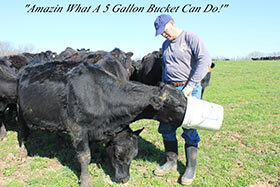 Our stock have access to a well balanced mineral program to enhance their well being. Minerals with ample supply of Calcium, Phosphorus, Salt, Magnesium, Potassium, Copper, Iodine, Selenium,Zinc,and Vitamins A,D,and E. Animals with correct nutrition levels breed back faster and raise better offspring. This is why we use the phrase,"The Quality Goes In Before The Brand Goes On". We truly believe our breeding stock is some of the finest you can buy for any price! We take the development of our breeding stock Very Seriously! Bulls are never treated like "Feed Lot" animals. 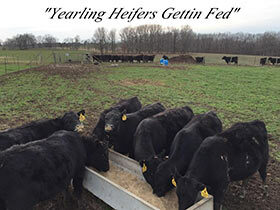 We could easily make our bulls weigh 12 to 1400 pounds at yearling weight but we believe that wouldn't be good for you. We expect our bulls to enter your herd,begin breeding immediately and not tire prematurely. We don't expect them to have rapid weight loss and loss of libido which many "Fat" bulls do. We expect them to have sound feet and be resilient. Most our bulls are 18-24 months old when sold.We don't believe a 12 month old bull is ready to be turned out to a herd for breeding. 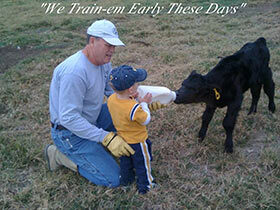 Our 18-24 month old bulls can cover more cows and are less likely to fail than a yearling bull. Our females are raised in a similar manner. We breed our heifers at around 15 months of age and expect them to calve at around 24 months. With very few exceptions our heifers should calve on their own with little or no assistance. We select our females based upon their pedigree and maternal traits. Animals that do not meet our expectations are culled. Last but not least, We stand behind our stock with a solid commitment to give you the most for the money you spend. We treat you the way we would expect to be treated and a handshake is our most prized commitment to you. We're truly not satisfied until You are. Call me anytime to discuss your needs. I will be glad to help.